Localization allows you define which countries and regions you would like to allow call-backs to, as well as the Supported Languages. A list of your current Supported Languages is located in the middle of the page (1). You can select additional languages, by checking the box beside each one, and then by clicking the green ‘Save Changes’ button (2) in the top right corner of the page. 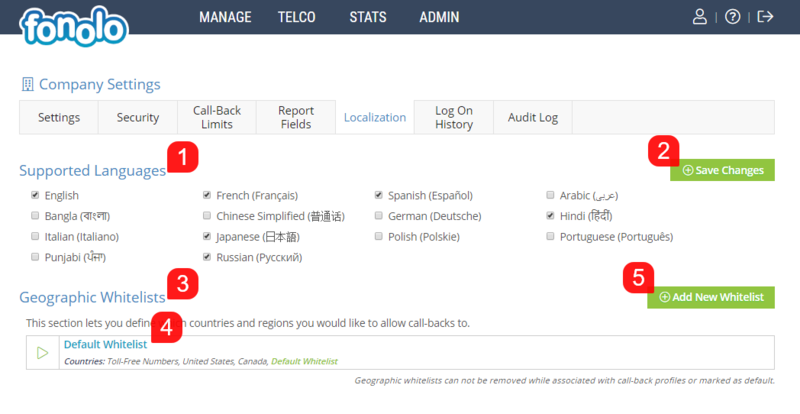 Geographic Whitelists (3) allow you to define which countries you want to enable call-backs to. Your current whitelists will be listed in the middle of the page (4), where you can click on the green ‘Play’ button on the left side of each Whitelist to enable/disable each one. On the right side, you can set a particular whitelist as default, as well as delete it. To add a new Geographic Whitelist, click the green ‘Add New Whitelist’ button (5). First, enter a Whitelist Label (1), for you to keep track of the Whitelist when adding it to Call-Back Profiles or Call Routing Profile in other areas of your Fonolo Portal. Next, select the regions that you would like to whitelist (2). You can select any combinations of regions listed in the pop-up. 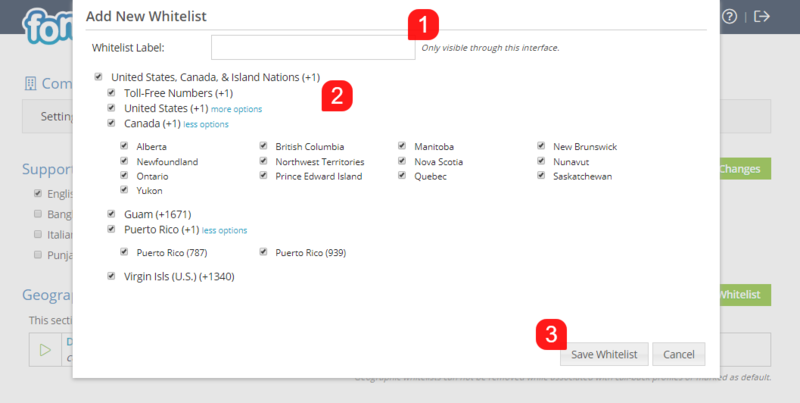 For Canada and US Fonolo Users, you can click the blue ‘more options’ link to choose specific States and Provinces. Once finished, click the grey ‘Save Whitelist’ button (3) at the bottom of the popup. Geographic Whitelists, once generated here, can then be applied to Call-Back Profiles and SIP Trunk Groups to more specifically control the regions that call-backs can be made to.